The purpose of the ignition system is to generate a very high voltage from the car's 12 volt battery, and to send this to each sparkplug in turn, igniting the fuel-air mixture in the engine's combustion chambers. The coil is the component that produces this high voltage. It is an electromagnetic device that converts the low-tension (LT) current from the battery to high-tension (HT) current each time the distributor contact-breaker points open. The distributor unit consists of a metal bowl containing a central shaft, which is usually driven directly by the camshaft or, sometimes, by the crankshaft. 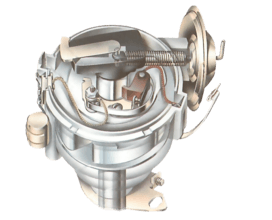 The bowl houses the contact-breaker points, rotor arm, and a device for altering the ignition timing. It also carries the distributor cap. The distributor cap is made of nonconductive plastic, and the current is fed to its central electrode by the HT lead from the centre of the coil. Inside the cap there are more electrodes often called segments to which the sparkplug leads are connected, one per cylinder. The rotor arm is fitted on top of the central shaft, and connects to the central electrode by means of a metal spring or spring-loaded brush in the top of the distributor cap. The current enters the cap through the central electrode, passes to the centre of the rotor arm through the brush, and is distributed to each plug as the rotor arm revolves. As the rotor arm approaches a segment, the contact-breaker points open and HT current passes through the rotor arm to the appropriate sparkplug lead. The contact-breaker points are mounted inside the distributor. They act as a switch, in synchronisation with the engine, that cuts off and reconnects the 12 volt low-tension (LT) circuit to the coil. The points are opened by cams on the central shaft, and are closed again by a spring arm on the moving contact. With the points closed, LT current flows from the battery to the primary windings in the coil, and then to earth through the points. When the points open, the magnetic field in the primary winding collapses and high-tension (HT) current is induced in the secondary windings. 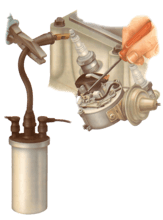 This current is transferred to the sparkplugs through the distributor cap. On a four-cylinder engine there are four cams. With each full rotation of the shaft the points open four times. Six-cylinder engines have six cams and six electrodes in the cap. The position of the points and the distributor's body in relation to the central shaft can be adjusted manually. This alters the timing of the spark to obtain an exact setting (see How engine timing works). Further changes occur automatically as the engine speed varies according to the throttle opening. 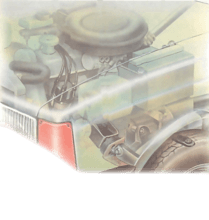 In some modern ignition systems, micro-electronics ensure the optimum ignition timing for all engine speeds and engine load conditions (see How engine timing works). The sparkplugs are screwed into the combustion chambers in the cylinder head. HT current passes from each segment on the distributor cap down the plug leads to the plug caps. It then passes down the central electrode, which is insulated along its length, to the nose of the plug. A side electrode connected to the plug body protrudes just below the central one, with the gap between the two usually set from 0.025 in. (0.6 mm) to 0.035 in. (0.9 mm). The current sparks across this gap, flows along the side electrode, through the plug body and the engine, then back to the coil, completing the circuit.